The Rebel Sweetheart. : And the World (Wide Web) Went Black. And the World (Wide Web) Went Black. 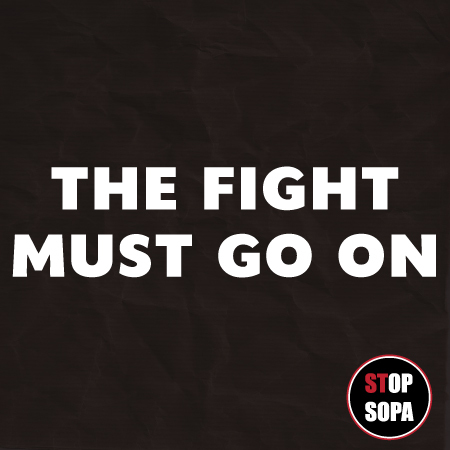 If you were greeted by a black-up pop box on my homepage, then now you know how I feel about this SOPA-PIPA thing. I'm not an American and neither am I from the US, but once this bill gets passed, it's only a matter of time before the same thing happens to the Philippines and to the rest of the world. I learned about this bill not too long ago, and this became one of my concerns when I bought my domain. The one that I originally wanted was actually up for auction at GoDaddy. But GoDaddy was pro-SOPA, and was even very vocal about it. This made me NOT to sign up with them, even if I could have the dot com of my dreams. I chose to go with Namecheap - one of the first few websites to publicly oppose and stand against SOPA. I commend the people at Namecheap for rallying against this misconstrued bill. And I'm not saying this because I'm their subscriber. I'm saying this from a writer's point of view. For a writer, freedom of expression is everything. But if SOPA takes effect, this freedom will be limited, marred, silenced. It's like dying a slow and painful death. If you're with me on this one, I encourage you to make your voice heard, too. Blog about it, tweet it, post it on your Facebook wall. More and more sites have gone black today. Let's take action before the entire world wide web goes black for good. An OFW Family's Key to Survival. WWE | It's in the Blood! Ohh, Baby Baby Giveaway Hop | Open for Signups! Project | Jung Il Woo. Macro (and Bokeh) is Love! Foodie Goodie | Pork Teriyaki. Haul | Pretty Pinks from Avon. Campaigns and Causes | Dream Big for Africa! Mommy Knows Life | I Was Featured! Today's Look | Smouldering Smoky. Join | Lucy's Stash Bloggiversary Giveaway! Random Rants, and My Boiling Blood Pressure. New Year Greetings and Love from Lee Jun Ki! Join | Peachy Pink Sisters New Year Giveaway! Munching on Marks and Spencer. Super Junior | Another Day, Another Daesang. Hair Story | The Long and Short of It. Today's Look | Green Eyes and Plum. Mud Packs and Dirty Laundry. Super Junior for the Win! I'm A Social Good Mom! The Little Pixie and her Jollibee Party. Siwon: The Super Way to Start the Year! My Fill for the New Year.